Since it's inception, Southern Comfort Solutions has been a leader in the HVAC industry by providing a high level of service and customer satisfaction surpassed by none. Every job, whether large or small, is treated with the same level of service our customers are accustomed to. Our staff of highly skilled service technicians & project managers will insure that your project is handled with the upmost professionalism and value you deserve. We service and install all major brands & types of air conditioning systems. 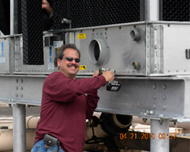 No matter what the job requires, call us and our team will help you find the right solution for your cooling needs.